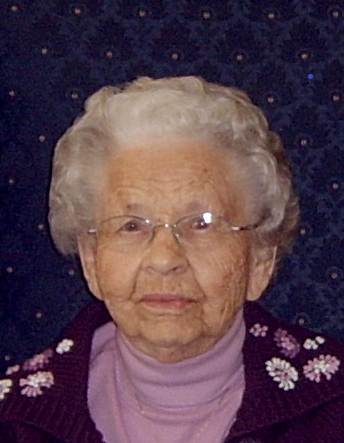 Bertha Dewald, 99, Jamestown, ND, died Sunday, March 3, 2019 at Ave Maria Village in Jamestown. Bertha Kirschenman was born May 14, 1919 west of Streeter, ND the daughter of John and Magdalena (Graf) Kirschenman. She attended the local elementary school and grew to womanhood on the family farm; in 1939 went to work in Streeter at the grocery and clothing store until 1946. She and Philip Dewald were married June 7, 1946 at Medina, ND. They made their home on the farm NW of Streeter where she raised their family. Philip retired from farming in 1982 and they moved into Jamestown in November of 2005. Following the death of her husband on August 20, 2008, she continued to reside in Jamestown. She moved into Ave Maria in July of 2017. Bertha was a member of Hope United Church of Christ in Streeter. She was also a member of the Women’s Guild and the Streeter Senior Citizens. She enjoyed gardening, cooking for the family and crocheting Afghans. She is survived by her children, Darrel (Bonnie) Dewald, Jamestown, ND; David (Elizabeth) Dewald, Bismarck, ND; 5 grandchildren, Dan Dewald (Stacy Miller); Nicole (Nathan) Parrett; Matthew (Kirsten) Dewald; Mike (Sarah); Ryan (Cassie) Dewald; and 9 great grandchildren. She was preceded in death by her parents; her husband; 7 sisters (1 in infancy); and 7 brothers.